If you have a lot of markers on small map area you are able to cluster them. Then on the map instead of markers group appears a label with the number of markers, which it replaced. By clicking on a label map scale is automatically changed to the markers were clearly visible. 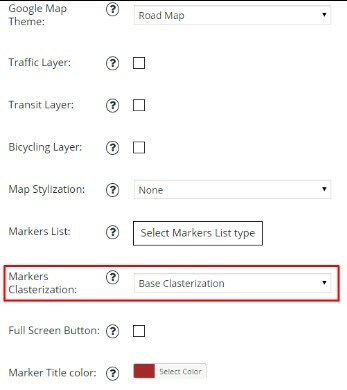 To enable clusterization select clusterization type in Markers Clusterization option on Map Properties tab.